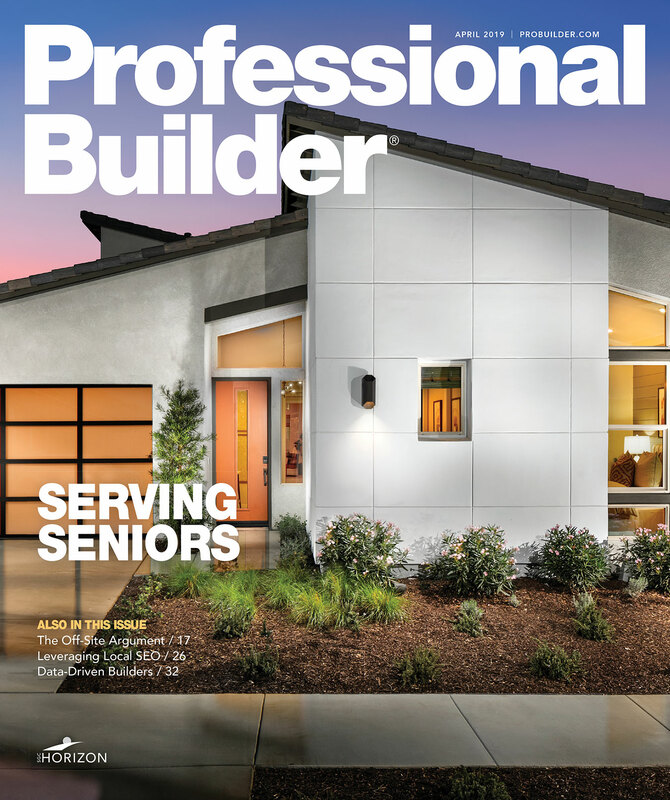 If the most powerful memories are the ones associated with feelings, it stands to reason that home designs need to tap into the buyer’s senses as well as their emotions. 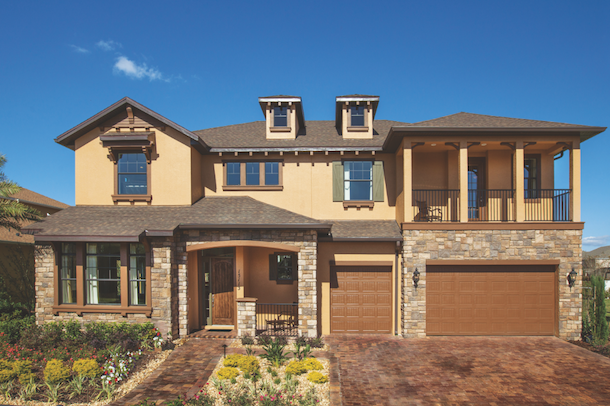 Whether it’s a front elevation, a unique room, or a single detail, memory points stick with buyers and bring them back to the sales office. Use these examples as inspiration to make your homes unforgettable. 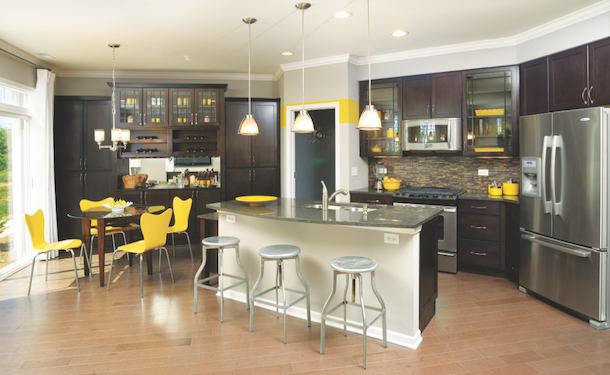 A tech center just around the corner from the kitchen is convenient for the whole family. Now the kitchen’s large island can be used for actual meal preparation and eating. 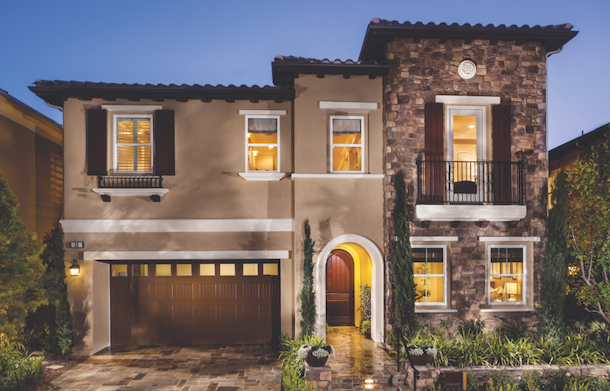 This home offers a taste of Tuscany with its clean architectural design and rich appointments such as shutters, wrought-iron balcony details, and stone. Tuscan landscape treatments complete the picture. 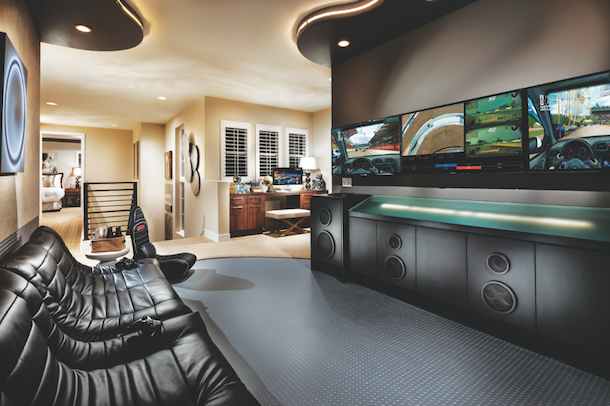 This loft makes teenagers’ eyes pop with its wall of TV screens, video-gaming seats, and pulsing speakers in the lower cabinets. It’s an imaginative choice for a space that can also be an optional bedroom or bonus room. When its glass sliding doors disappear into the wall, this living room blends into a sunken outdoor sitting room and kitchen. The stone wall, with its fireplace and TV, has a circular opening that offers glimpses of the landscaping and views beyond. Never underestimate the drawing power of a front porch. 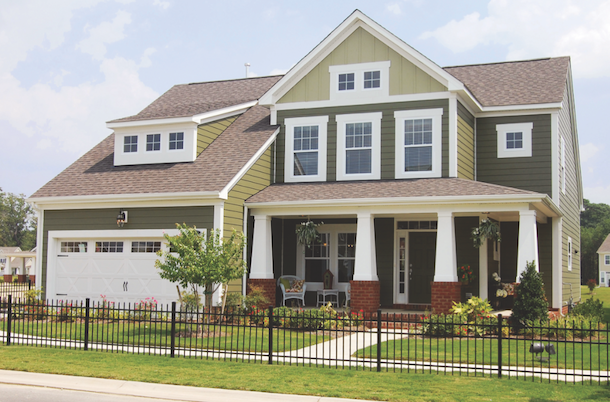 In this community, the porches are a talking point. Here, a Craftsman-style porch, with tapered columns set on brick piers, wraps around the side of the home. 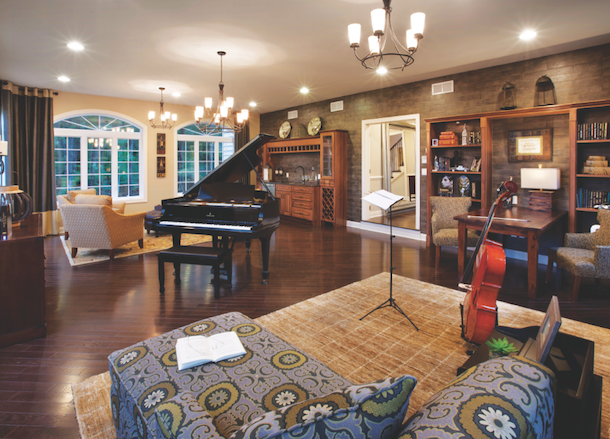 Executive move-up families in an affluent suburb of New York City will have no trouble envisioning music lessons and after-dinner entertainment taking place in this conservatory. 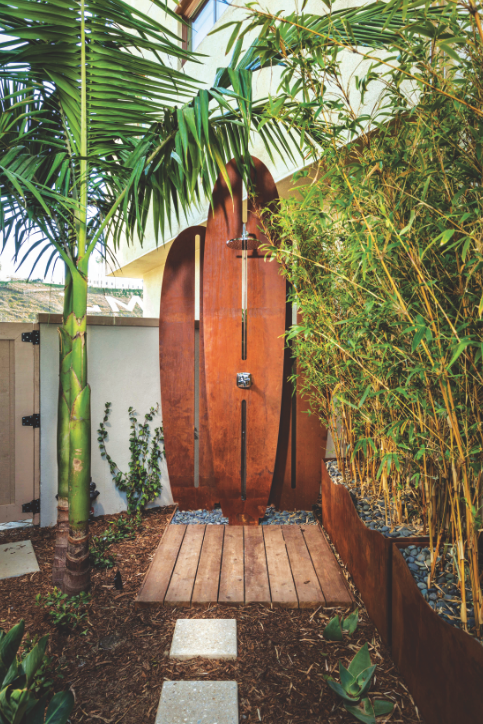 An outdoor surfboard shower constructed of stained teak is a unique selling feature of an upscale home in Playa Vista, Calif.
An entire secondary bedroom is showcased as an extension of a large walk-in closet in this luxury home. Not just a dressing room, the space is reminiscent of an exclusive women’s boutique. 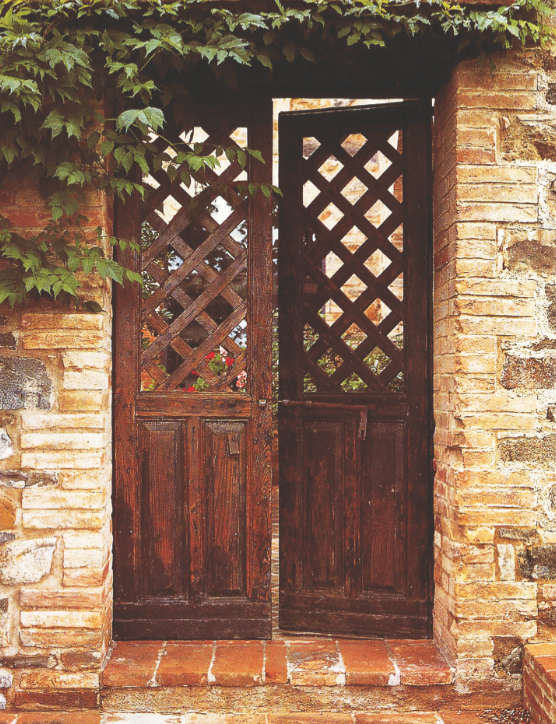 Interior barn doors are a major trend and provide a strong memory point for home shoppers. 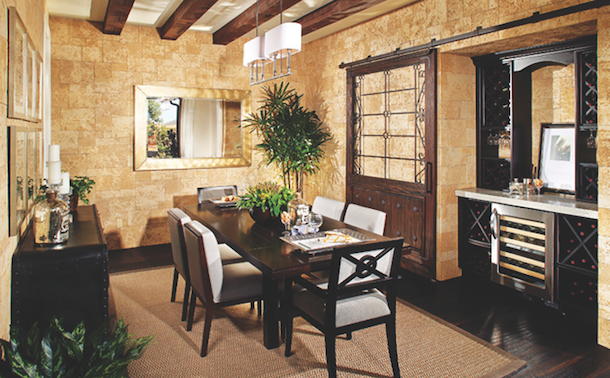 In this dining room, a Spanish-influenced barn door slides open to reveal a complete wine storage area. 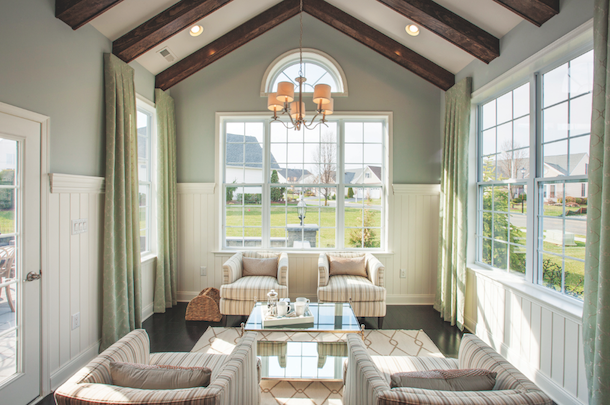 This sunroom expands the kitchen and breakfast area and not only provides natural light, but is also an away room—a quiet place to get away, either alone to disconnect or with a small, intimate group of adults for a glass of wine after dinner or an afternoon cup of tea. An extended cabinet run in the kitchen is detailed to integrate a wine bar, a memorable detail for single professional men that shows how the home can enhance their lifestyle. This home office/den resonates with single professional males buying their first residence. They can easily picture themselves here, working or relaxing with a friend over a backgammon game. 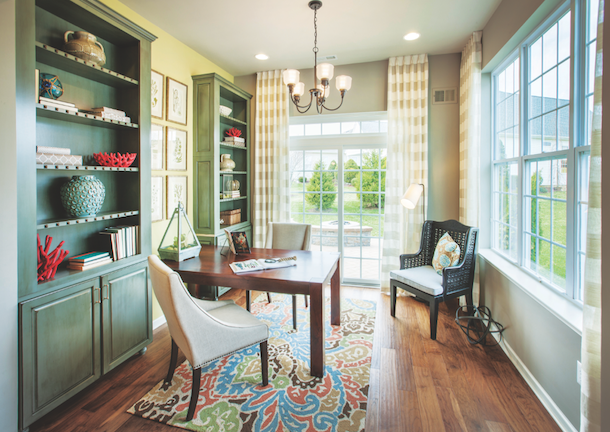 This flex space was conceived as a craft, hobby, or work-at-home space for an active adult. Mary Cook Associates chose to design it for a female who grows her own herbs and wildflowers, collecting some of them to press, mount, frame, and sell on Etsy.com, a website for crafters and artisans. 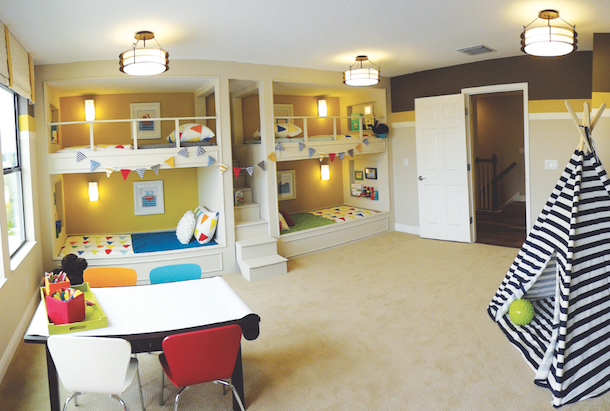 Empty nesters instantly see the appeal of this colorful bunk room for their visiting grandchildren. A center stair provides easy access to the upper bunks, and each bed has a niche for books, toys, and keepsakes. There’s also a craft table and plenty of floor space where the kids can spread out. 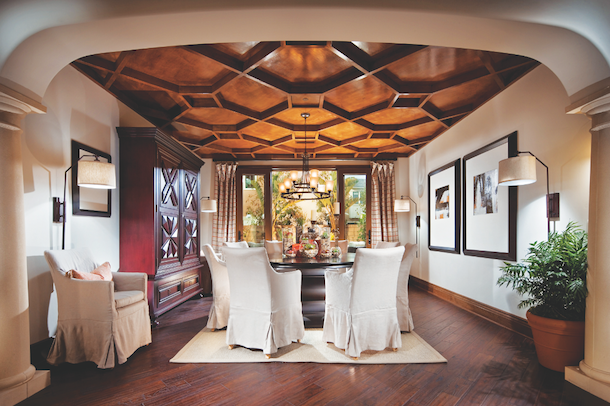 Applied wood trim on the walls of this study forms a connection with the angled ceiling. It eliminated the cost of adding bookshelves, creating an interesting wall detail that really makes the room. To make it even more unique, the room has sliding glass doors that meet at the corner. 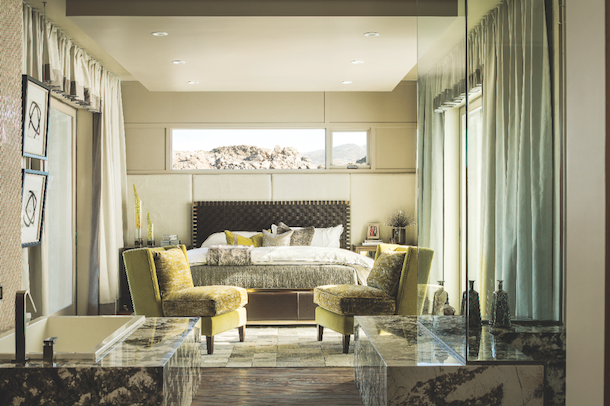 A clerestory window in the guest suite offers a tantalizing peek at the mountains nearby. 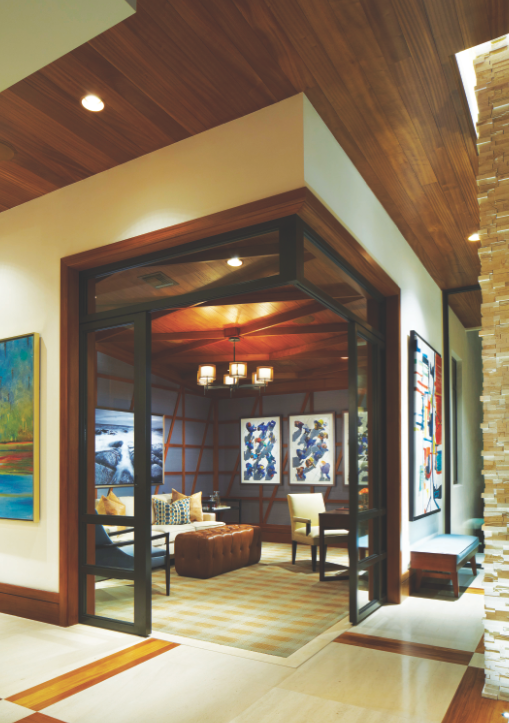 The objective of the wood-and-stone flooring pattern in this home was to create a different yet cohesive feel from the foyer to the great room and dining room, because those spaces are so open to each other. The floor also ties in with the wood ceiling and incorporates stone used in other parts of the home. 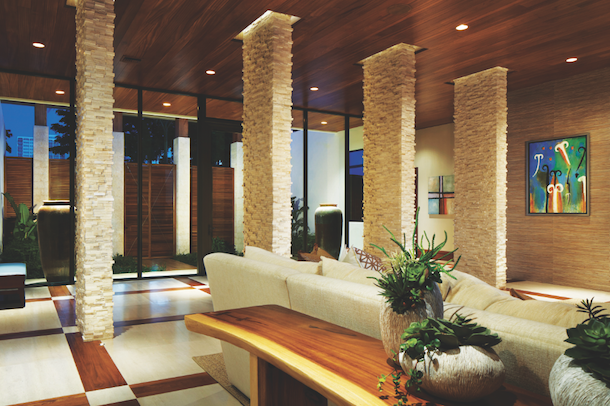 Creamy white, stacked ledgestone columns in the living room draw the eye upward to the wood ceiling and keep the space feeling bright and open. Buyers can’t fail to admire the roof and dormer details on this home, as well as handsome brick pavers in the walkway and driveway. 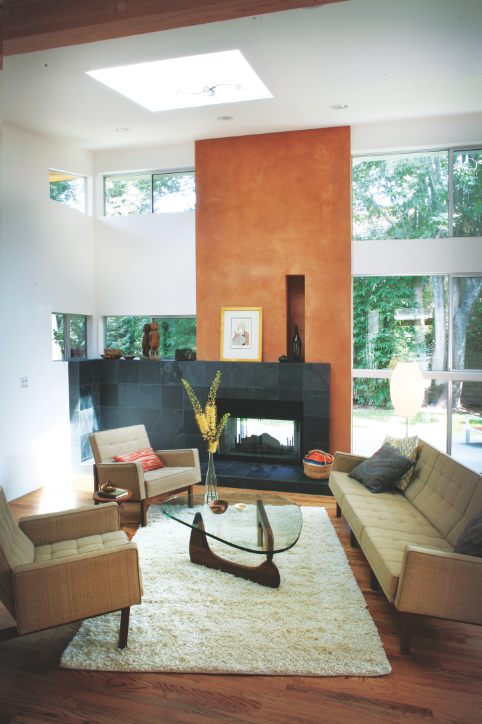 A smooth-troweled, terra cotta plaster vertical element above the midnight-black slate tile hearth adds visual interest alongside warm mid-century furnishings that also complement the interior architecture. The fireplace is exposed to the backyard, creating a true California indoor-outdoor relationship. 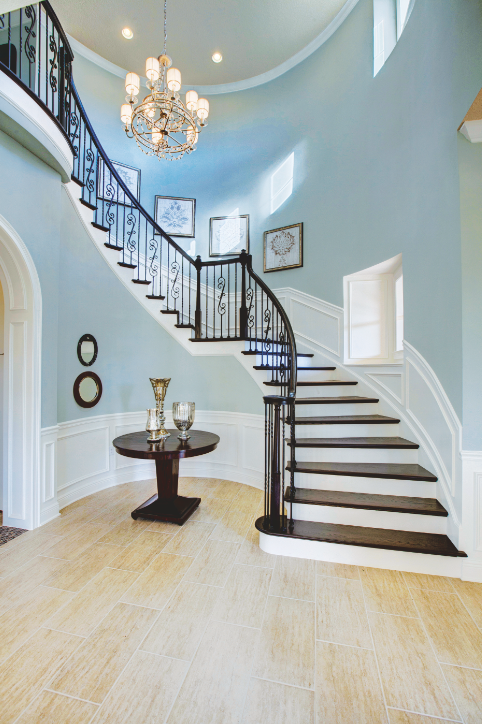 There’s nothing as romantic as a gracefully curved staircase, accented by wainscoting and deep window sills. 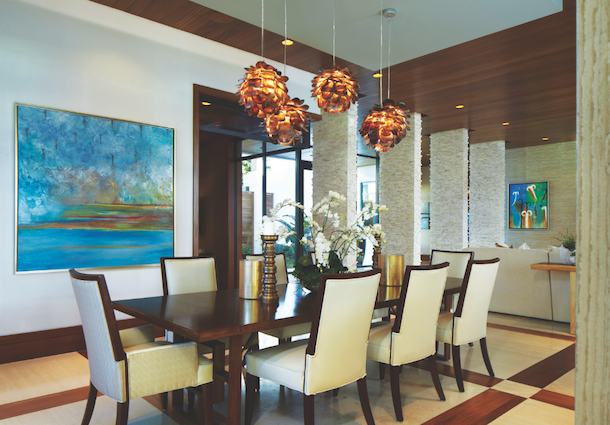 An elaborate honeycomb wood ceiling in the dining room draws buyers’ eyes upward, allowing them to appreciate the soaring volume of the space.